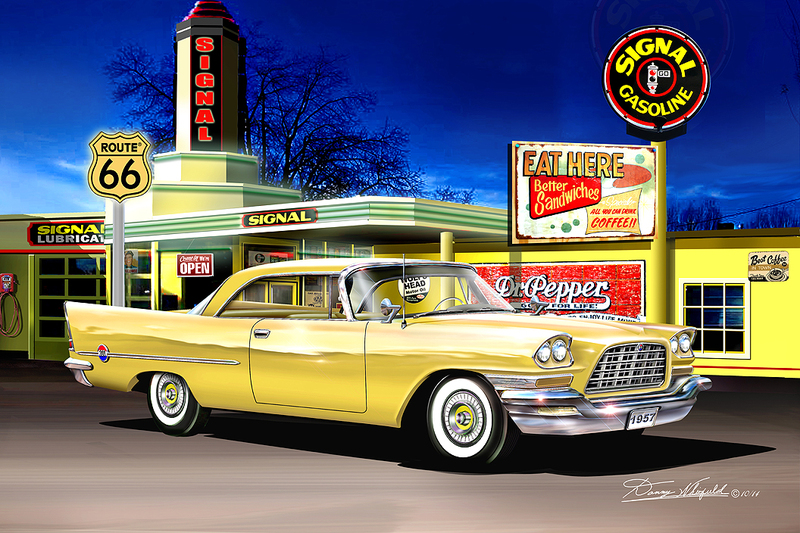 This entry was posted in Car Art - Automotive Art of Danny Whitfield and tagged automotive art, canvas, car art, contemporary paintings, Danny Whitfield, dealerships, ford, muscle car, mustang, posters, prints. 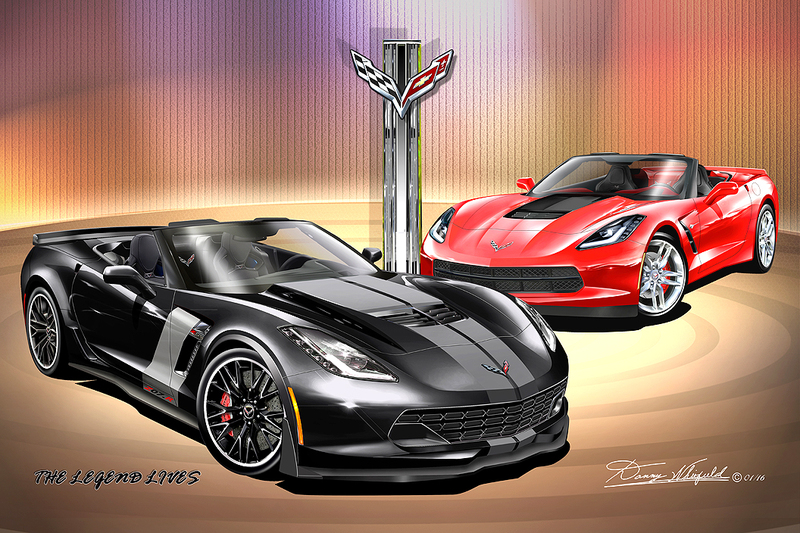 This entry was posted in Car Art - Automotive Art of Danny Whitfield and tagged automotive transportation, chevrolet corvette, contemporary paintings, Danny Whitfield, dealerships, General Motors, posters, prints. Famous horses have been featured in works of art for since the dawn of time, in the days of old a prize stallion would be immortalized in oil and the canvas hung proudly above its owners mantle for all to admire. Today your prize pony can also be immortalized and hung for admiration with an original print from the ‘Automotive Michelangelo’ himself, Mr Danny Whitfield. For a limited time with the purchase of a new Ford Mustang from Raceway Ford in Riverside, CA, you will receive a framed print signed by the artist of your new car purchased for you by our own Mustang Man Mike theCarGuy. Imagine having your co-workers admiration of your new Mustang when they see it hanging on your office wall or your friends and family being able to see your prized stallion as it hangs prominently on a wall in your home! 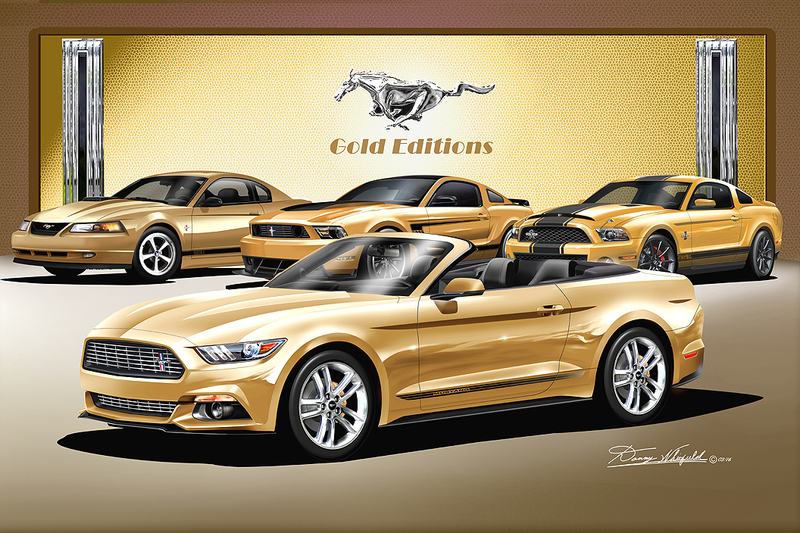 The remaining 2014 Mustangs are moving briskly so time is critical, if you have your sights on a new Pony the time is now, and when you buy your new car you will get one to hang on the wall too! 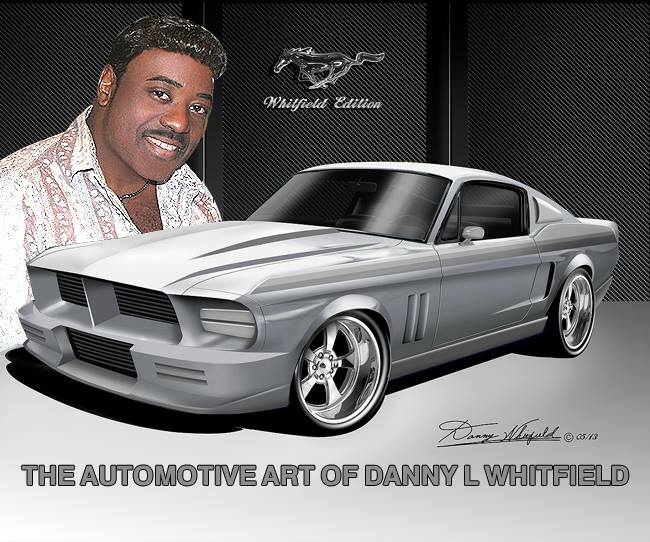 “Danny Whitfield was born and raised in Detroit, Michigan, “Auto Capital of the World, He brought his vision of art and cars to the fore front and has been the key artist in making automotive art a respected form in the industry. Whitfield has a magical ability to bring out the beauty of an automobile and expression vividly onto canvas. He has the ability to paint and draw and does many forms of art from scenic, architectural, to portrait images. However his affinity and love for automobile is his first love. Ever since he was five years old he’s been drawing cars. This is his passion! 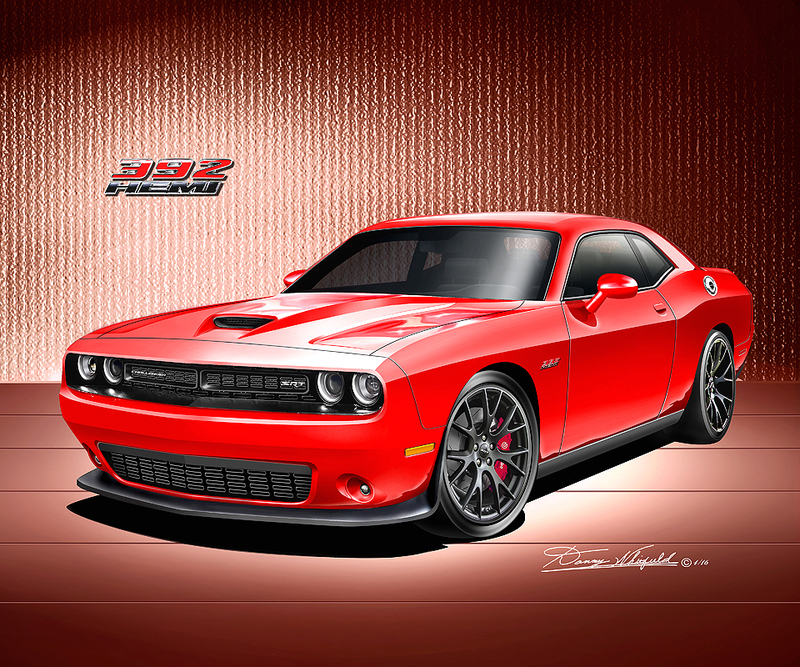 After attending Center of Creative College in Detroit and Macomb County College in Warren Michigan, He began his career working for the Ford Motor Company, and many other Auto motive design firms as an Artist, Stylist, Designer and Illustrator. Whitfield gained much experience and enjoyed his time greatly working in the industry, yet something inside was driving him in a different direction. Whitfield enjoyed most creating his own fine art pieces. 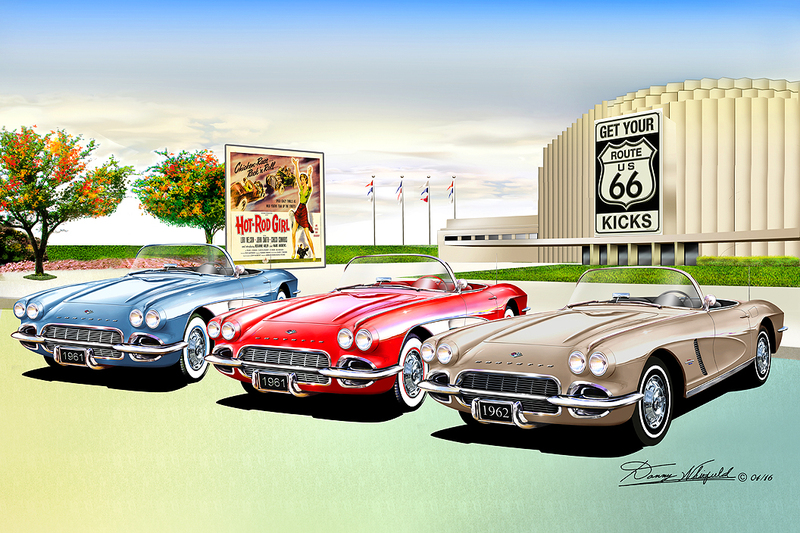 During a time when automotive art was more popular at car shows Whitfield began presenting pieces in this forum to enthusiasts at these venues. This was not an easy task as most were somewhat selective on who they accept into their close nit groups. Plus the fact many local galleries didn’t seem to accept cars as art nor were not happy to see Whitfield achieve success. Many enthusiasts wanted to see his work but were denied that privilege based on the “Good old boy” networks. This had little effect on him as he was determined to share his love for automobile art with the world. With every obstacle placed before him he overcame them all and continued his journey. 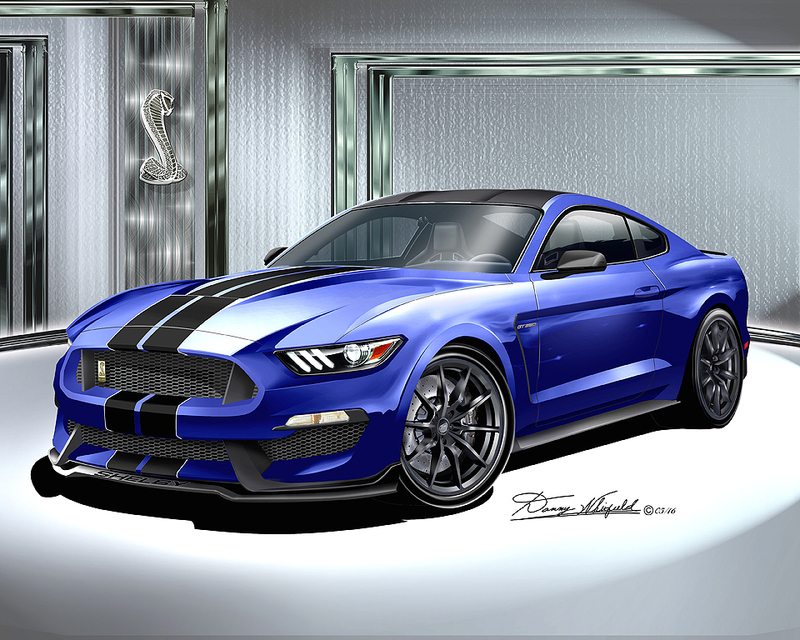 This entry was posted in Car Art - Automotive Art of Danny Whitfield and tagged 2015 mustang, art, canvas, Danny Whitfield, dealerships, deco, muscle car, poster, print, Raceway Ford, Raceway Ford dealership, Riverside California.